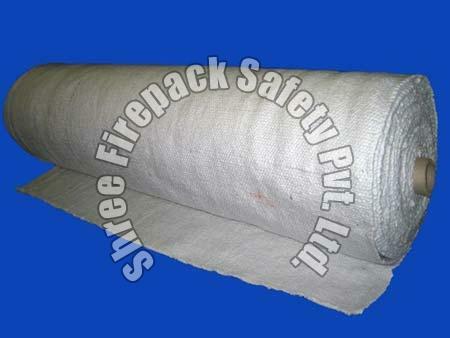 We are the topmost Ceramic Fiber Cloth Manufacturer and Supplier located in India. Made from the finest grade material such as alumina silica fiber and ceramic fiber yarn, our Ceramic Fiber Cloth are mechanically needled for high tensile strength and surface integrity. Their features like lightweight, flexible, high-grade have fetched so many buyers in the market. Buyers can get them in wide variety of thicknesses, widths and densities, from us. Ceramic fiber cloth contain absolute amount of binder material that is normally burned at lower temperature and does not affect the insulation property. Ceramic Fiber Cloth is a woven fabric made from high quality alumina silica fiber and especially mechanically needled for increased tensile strength and surface integrity in form of ceramic fiber yarn. It can be used for high temperature applications up to 2300 F. the cloth is reinforced with fiberglass filament, and optional Inconel/alloy steel wire. Ceramic fiber textiles feature excellent properties of lightweight, low thermal conductivity and chemical stability resisting attack from most corrosive agents. This cloth is widely used in welding, foundry works, aluminum and steel mills, boiler insulation and seal, shipyards, refineries, power plants and chemical plants. Length : As per specification & requirement.